Luxury meets strength. This adaption of an OGX favorite helps deliver superior hydration with a thicker and creamier formula. Made with silk proteins and argan oil, it helps leave your hair lush, soft and luxurious. 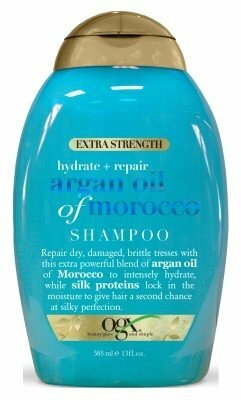 This OGX extra strength argan oil of morocco repairs dry and damaged brittle tresses; Silk Proteins lock in moisture creating softer, silky tresses as the Argan Oil Hydrates the hair. Formula is thicker, creamier, and more moisturizing than OGX original formulas. 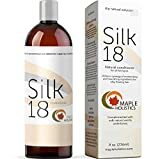 Best combination of silk proteins with the benefits of argon oil for superior hydration and repair. 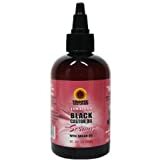 Best for brittle, dry, damaged hair. Packaging is upscale, shiny vibrant color with metallic iridescent labels. OGX Hydrate + Repair Argan Oil of Morocco Extra Strength Shampoo Repair the damage of over styled, brittle tresses wth this extra powerful blend of argan oil of morocco to help mend and hydrate while silk proteins help strengthen tresses to giv your hair a second chance at soft, seductive silky perfection. 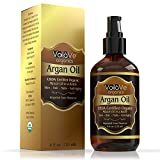 This potent blend of extra strength argan oil of Morocco plus silk proteins helps repair even the most severely dry, damaged strands, drenching them with hydration, strengthening from within, and creating soft, seductive, silky tresses. How to Use- Apply shampoo generously to wet hair, massage into a lather through to ends, then rinse the hair thoroughly. After shampooing, follow with conditioner. For best results use in conjunction with other OGX products. Ingredients- Water (Aqua), Sodium C14-16 Olefin Sulfonate, Cocamidopropyl Betaine, Glycol Distearate, PPG-2 Hydroxyethyl Coco/Isostearamide, Argania Spinosa (Argan) Kernel Oil, Silk Amino Acids, Dimethicone, Amodimethicone, Glycerin, Cocamidopropyl Hydroxysultaine, Coco-Betaine, Guar Hydroxypropyltrimonium Chloride, Sodium Cocoyl Isethionate, Cetrimonium Chloride, Laureth-4, Laureth-23, Polyquaternium-6, Polyquaternium-10, PEG-150 Pentaerythrityl Tetrastearate, PEG-6 Caprylic/Capric Glycerides, Trideceth-12, Sodium Chloride, Citric Acid, DMDM Hydantoin, Diazolidinyl Urea, Iodopropynyl Butylcarbamate, Fragrance (Parfum), Red 40 (CI 16035), Yellow 5 (CI 19140).